It’s August, which means a few great things. 1) My birthday is just around the corner and 2) Tomato Season is in full swing! If you’ve never been to Nashville, you’ve probably never heard of the Tomato Art Festival. It’s exactly what it sounds like – one huge party in East Nashville to celebrate our favorite fruit – the tomato – and all the great art Nashville has to offer. Now, normally I’m not much of a tomato person, but when I saw so many delicious red fruits at the Farmer’s Market, I couldn’t resist! I loved canned tomato soup when I was younger (with a little grilled cheese on the side), so I decided to recreate the recipe with a healthy twist! 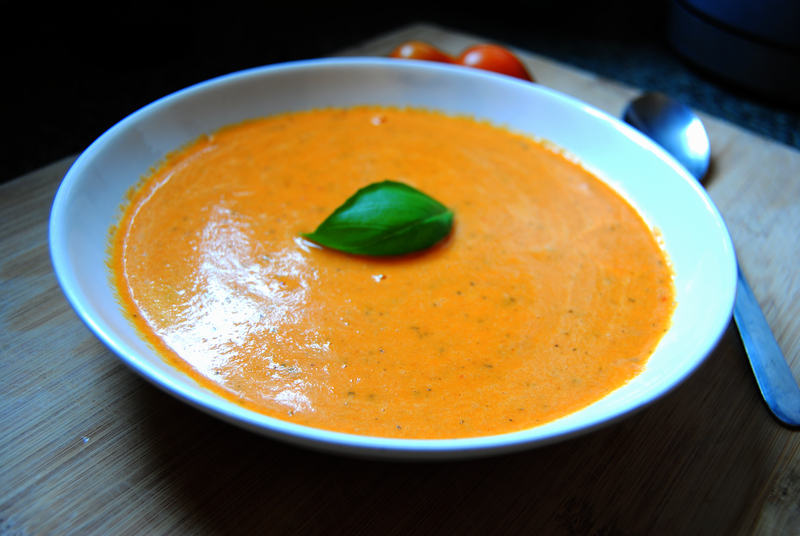 In lieu of the Tomato Art Festival, I created this yummy Paleo Cream of Tomato Soup. Preheat oven to 450F. 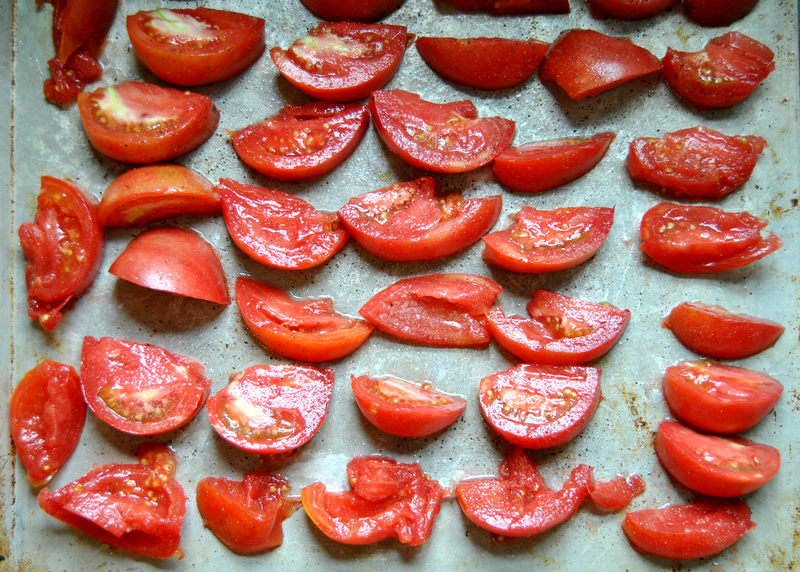 Place quartered tomato on baking sheet and spray with coconut oil . (I use spray coconut oil from Trader Joe’s) Season with salt and pepper. Roast tomatoes for 30 minutes. In a large stockpot over medium heat, heat coconut oil. Add onion and garlic. Saute until onion is translucent. Add roasted tomatoes and stir. Cook until tomatoes have liquified slightly. Add water, basil leaves, and spices. 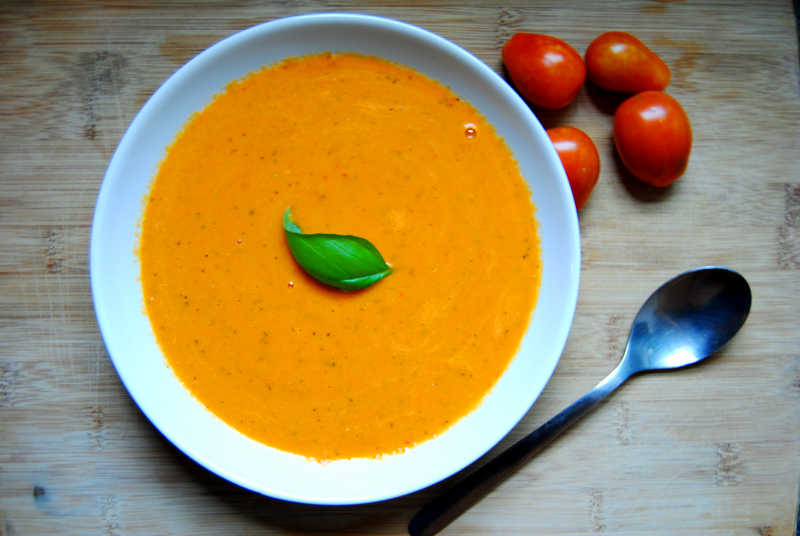 Using an immersion blender, blend the soup until no chunks of tomato remain. (If you don’t have an immersion blender, get one!) Add coconut milk and continue to blend until thoroughly incorporated. Cook over low heat for an additional 20 minutes to allow flavors to simmer. Add salt and pepper to taste. This isn’t just any tomato soup. It’s thick and creamy with a coconut kick. Very reminiscent of curry, this tomato soup has a delicate basil flavor, with a bit of peppery spice. For best results, use farm fresh tomatoes and basil. Lucky for me, I live a block away from the Farmer’s Market and have three basil plants growing at my house! The soup is very filling (I could only eat a cup), but so delicious, you may want to eat another. Savory every slurp though, Tomato season won’t be here much longer! Thanks!! 🙂 Glad you enjoyed! Yum! My birthday is around the corner too! Happy B-day fellow Leo! This look great! I love that you put coconut milk in. The flavor profile must be awesome! Thanks for stopping by! The flavor is out of this world, creamy tomato, delicate basil, and a hint of coconut! You certainly love your coconut milk! MMMMM,…a lovely cream of tomato soup! I LOVE tomatoes and I am newly in-love with roasting tomatoes so this post/recipe is right up my alley … in fact, I think I’ll have to adjust my grocery list to make sure I have everything to try this soup out! Thanks … maybe you’ll like my Creamy Roasted Tomato Garlic Sauce with Pasta (if you have any other tomatoes you need to use up!). Tomato + Coconut Milk + = a Dream . . . This is so me- thanks for sharing. I make a similar tomato soup and continue to take favorites and re-work them to make them healthy (and affordable!). Feel free to check my blog out any time. Looking forward to reading more of your posts!